Under the umbrella of the estate tax is the gift tax. Gift taxes apply to funds given away while the taxpayer is living. The gift tax is a tax on the transfer of property by one individual to another while receiving nothing, or less than full value, in return. The tax applies whether the individual intends the transfer to be a gift or not. The gift tax applies to the transfer by gift of any property. A gift is given if you give property, money or the use of or income from property. Gift taxes prevent individuals with large estates from giving away all their assets to their heirs during their lifetime to avoid estate taxes. The IRS offers generous gift exclusions. As of 2017, the annual exclusion is $14,000, which means a tax payer can give away $14,000 to individual people. For example, a tax filer can give the maximum gift of $14,000 to ten people but he cannot give one individual $20,000. If the amount exceeds $14,000 to an individual, the sum that is over the amount will be added to his estate when calculating his estate tax. 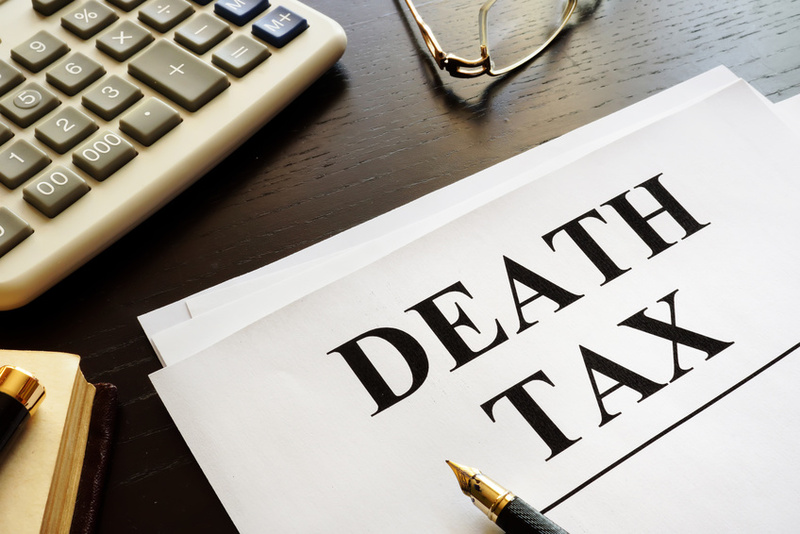 Inheritance tax is the second type of death tax. This tax applies to assets after they have been inherited by someone. Once the executor of the estate has divided up the assets and distributed them to the beneficiaries, the inheritance tax becomes assessed. The tax amount is calculated separately for each individual beneficiary. Inheritance tax will be collected if the estate passes to someone who is subject to this tax. Although the Federal government does not have an inheritance tax, currently there are six states that do collect inheritance taxes: Iowa, Kentucky, Maryland, Nebraska, New Jersey and Pennsylvania. Depending upon your relationship to the deceased, you may be qualified to receive an exemption or reduction in the amount needed to be paid. Transfers to surviving spouses are exempt from this tax. In Iowa, Kentucky, Maryland and New Jersey transfers to surviving children and grandchildren are exempt. Estates and inheritances are nice to receive; however, the taxes owed can become quite complicated. Since the estate tax can be high, careful estate planning is advisable for individuals who want to leave significant assets to their beneficiaries without facing high taxes. If you have inherited assets or want to leave assets and have questions regarding what steps you should take, contact Scott Horewitch Pidgeon and Abrams, LLC at 847-850-5300 so that we can help determine your most efficient tax savings.